If you’re a fan of reading and you happen to be in Scotland, this is a brilliant week to meet all sorts of talented authors! From Monday 26 November to Sunday 2 December, one hundred authors and illustrators will be appearing in libraries right across Scotland to talk about books and writing and share their latest creations with their fans. In most cases tickets are free, but it’s a good idea to visit the Scottish Book Trust website and BOOK A PLACE! There will also be a national Reading Hour on St Andrew’s Day (Friday 30 November) at 11:00 am, when everyone will stop what they’re doing and read for an hour! At the National Museum in Edinburgh, Alexander McCall Smith will read stories for adults, Lari Don will spin her storytelling magic for the younger crowd, and there will be a Bookbug session for the smallest book fans. The Mitchell Library in Glasgow has strung up 100 metres of bunting and 200 balloons in readiness for their Book Week Scotland events! They will host all sorts of talks by authors (for both children and adults), writing and illustrating workshops, a debate on the future of books and a Bookbug session in Gaelic. The Big Read In will be Glasgow’s answer to National Reading Hour on 30 November. They are also hosting the Scottish Book Trust’s Young Writers’ Conference on Saturday 1 December, a day of author talks and workshops for budding writers aged 14 to 17. So what are you waiting for? Time to get involved! A while back my family and I visited a very unusual museum called the Thursford Collection in Fakenham, Norfolk. 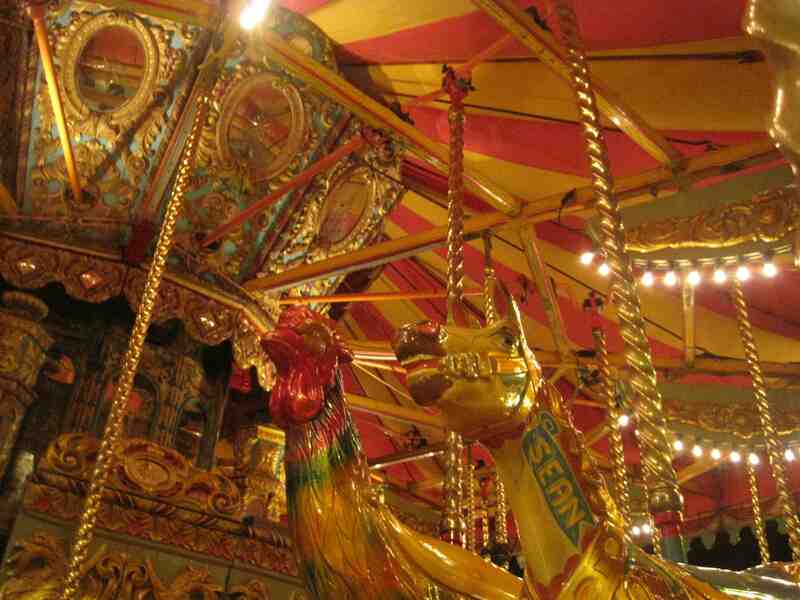 Inside a dark, cavernous former barn is housed the most remarkable collection of giant street organs, steam-powered tractors and gaudy Victorian fairground rides. Everything sparkles red and gold in the huge hall lined with spotlights. The decorative steam tractor above was designed to replace horses as a means of pulling heavy loads along paved roads (as you can see by the smooth tyres). Larger versions of this sort of vehicle with ridged tyres were used to pull ploughs on farms from the 1850s until the early 1900s. Because they were much heavier than horses, these big iron tractors had a bit of trouble and would often get stuck in a muddy field! 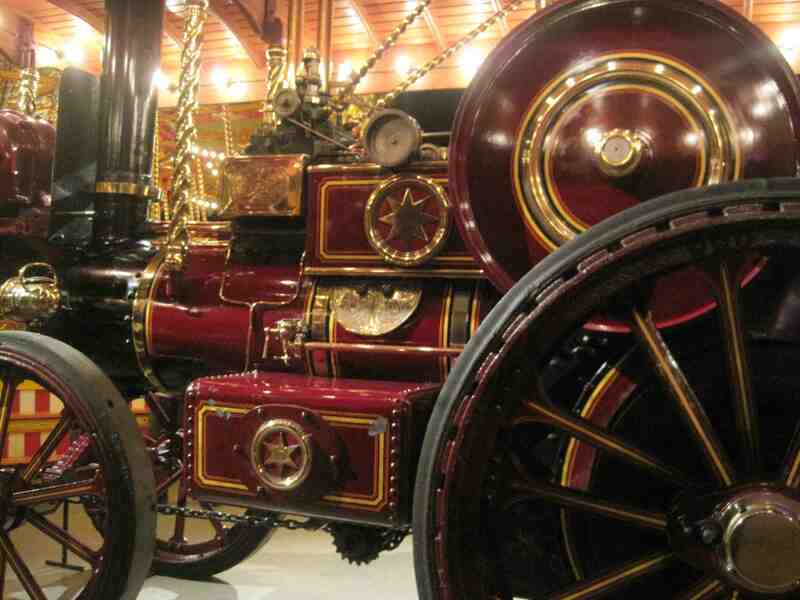 The fancy red-and-gold steam tractor may well have had a “showman” purpose at a fair, where it would have been used to pull a handsome street organ to the fairground. 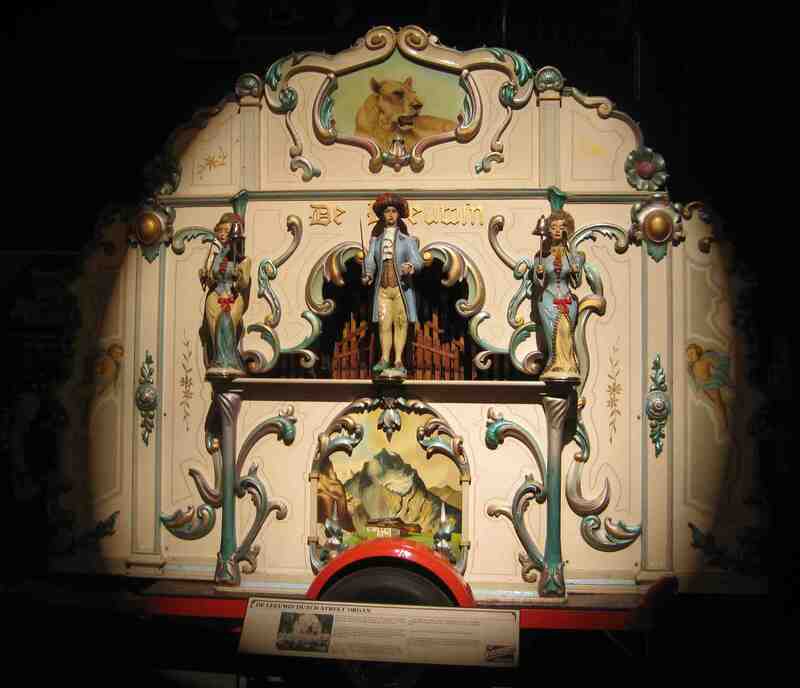 The small one shown above is a street organ built by Carl Frei, a German musician who started repairing them as a young man. 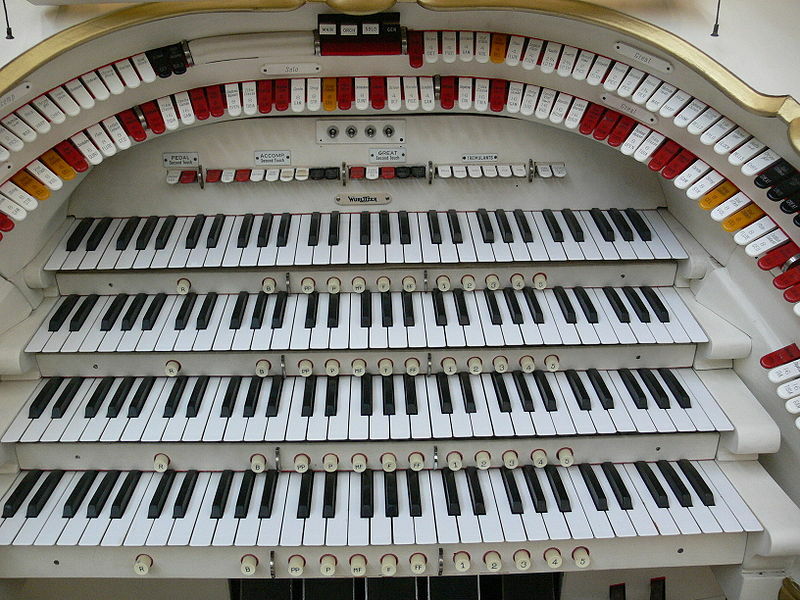 Later he went on to modify and improve on the design to create a bigger sound, and he built his own “Traveling Concert Organs” from 1920 until his death in 1967. You can see the female figures have also got much shorter skirts! The almost life-size ladies at each end of the display are holding drums which they tap in time to the music. 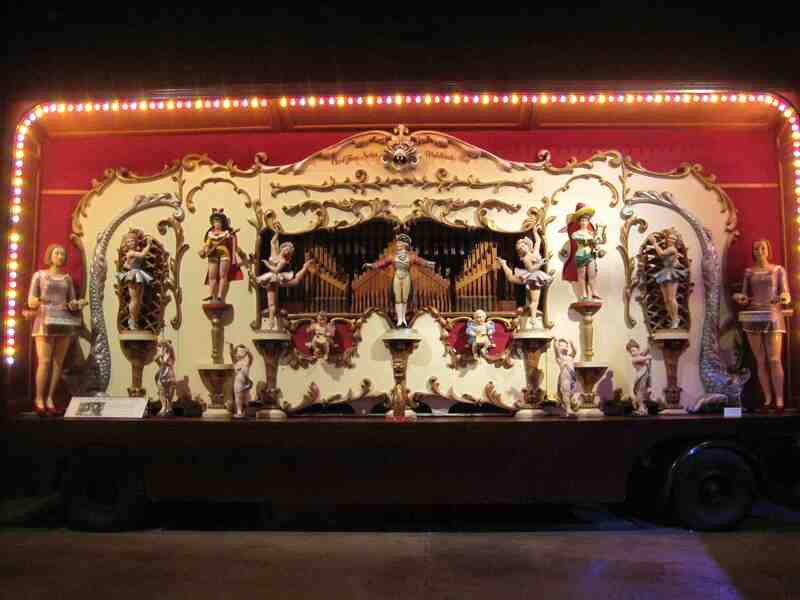 Not only did these amazing machines produce complex pipe organ music, but the figures in front also entertained the audience with their clever mechanised movements. 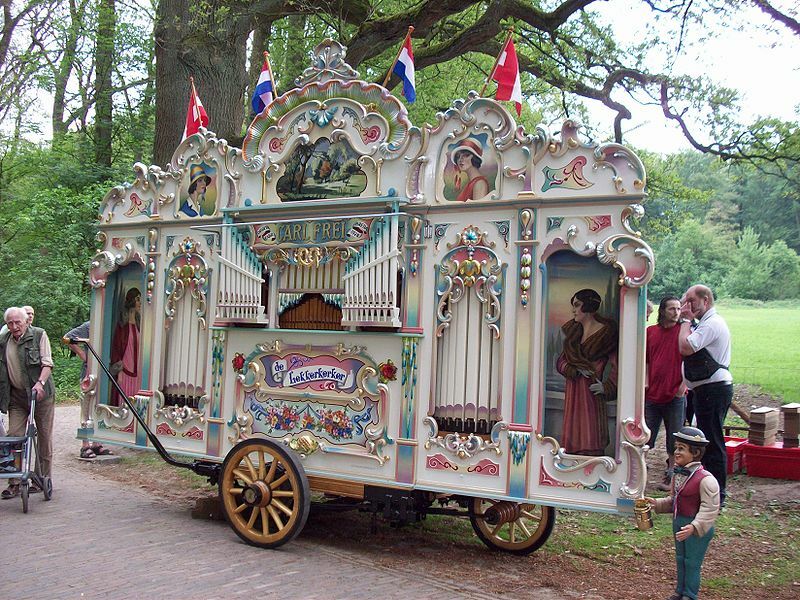 This type of organ is most widely known as a Dutch street organ, although most were built in Germany, France, Belgium, England and the USA. It seems they were so popular in the Netherlands that this was where many of them ended up! The organ above was made in Paris, and you can see it must date from around 1900 because it has four elegant ladies painted very much in the style of Alphonse Mucha. Not only did the organist play all four of these keyboards at once, he was also using his feet to tap on about forty pedals underneath! Talk about multi-tasking! I don’t think I was alone in being very impressed. So if you happen to be in Norfolk, the Thursford Collection is well worth a visit. 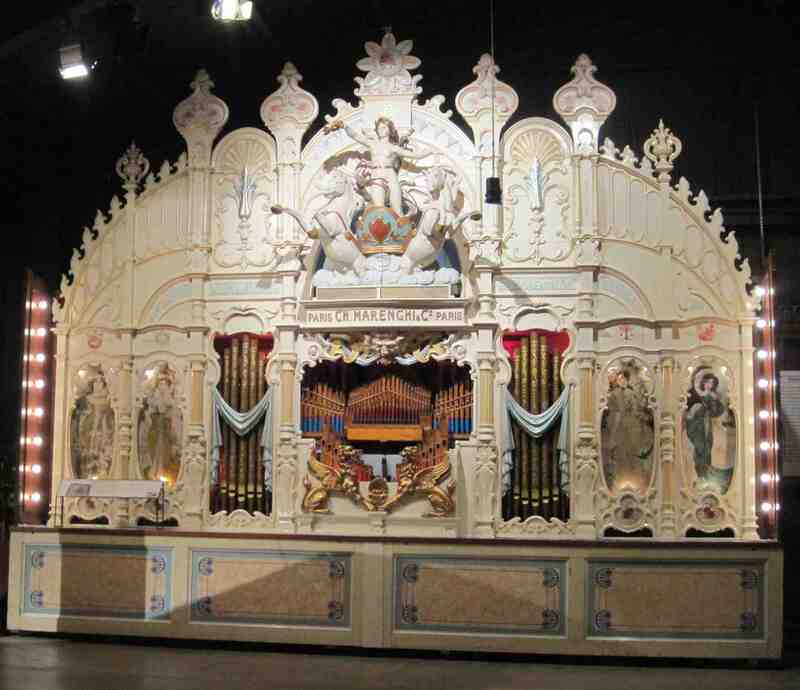 There are other street organ museums in St Albans, Scarborough and Utrecht in the Netherlands (and I’m sure other places). There’s even a Fair Organ Preservation Society and a Mechanical Organ Owners Society. Something for everyone! A while back my friend Lari Don mentioned me in her blog called The Next Big Thing. This is a sort of game invented by another author, in which we each take a turn answering a set of questions about our next book or creative project, and then we list five other authors whose work we admire. What is the working title of your next creative endeavour? I’m currently working on Pink! the Musical, based on my best-known picture book (illustrated by the talented Margaret Chamberlain). 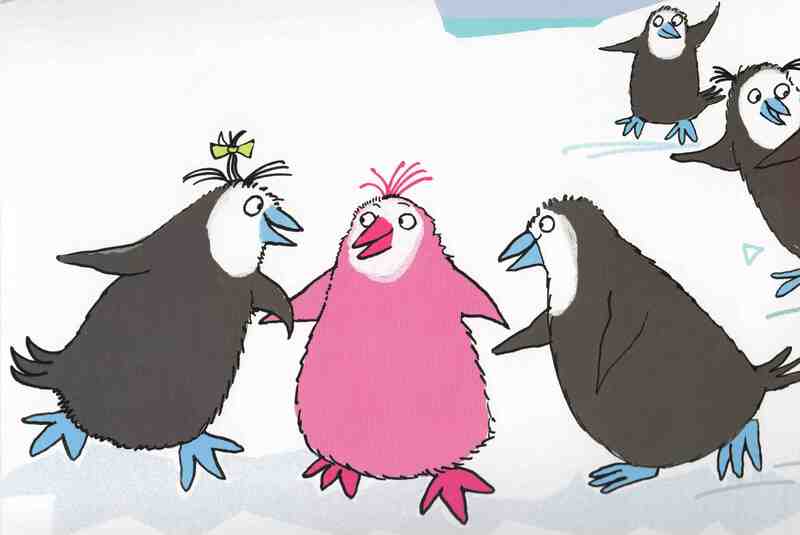 The original book was inspired by my daughter, who came up with the concept of a penguin who turns pink. She had no more story than that, but I thought Pink! was a brilliant title for a book and set about writing it immediately. The idea of turning it into a musical came when I was listening to an interview with Sir Tim Rice (lyricist for many celebrated musicals). He said that not many people were writing original musicals these days, and I suddenly thought, WHY NOT? Give a synopsis of the story. Patrick the penguin, teased and taunted for being pink, swims all the way to Africa in search of other pink birds. He soon discovers that he can’t do anything flamingos can do and that penguins, whatever their colour, belong at the south pole. He gets a hero’s welcome from his friends who have missed him and are amazed to hear about his exotic travels. His pinkness long forgotten, Patrick is home at last. How will Pink! the Musical be produced? Thanks to a generous grant from Creative Scotland, the musical will be produced by the Hopscotch Theatre Company which has been bringing high quality pantomimes and children’s theatre to schools across Scotland for over 20 years. I have been working with their expert manager Susan McGregor, experienced director Ross Stenhouse and talented musical director Alan Orr to create a 40-minute show for children aged 4-7. Professional set and costume designers will soon get working on puffy penguin suits and antarctic scenery. The show will be toured in 80 primary schools across Scotland starting in April 2013. This production will have three actors, two male and one female, to play six parts: Patrick, his two friends Arthur and Lulu, his Mum and Dad and Doctor Black. Hopscotch Theatre have all sorts of talented Scottish actors to choose from, and I’m sure they will have brilliant singing voices. 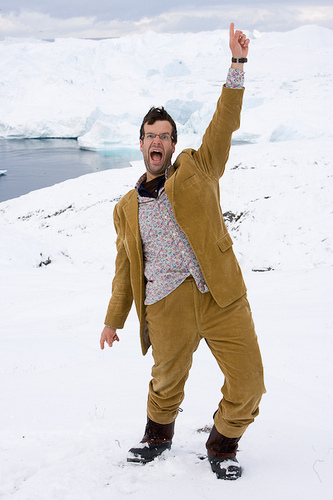 If Pink were a West End or Broadway musical I would choose Marcus Brigstocke to play Patrick! How long did it take you to write the manuscript? The original picture book took several weeks of thought and redrafting, and the musical script will go through three drafts before it is ready to go to rehearsal. Transferring the picture book text to drama dialogue has been easier than I imagined. It was hugely helpful to go through the first draft with Ross Stenhouse and Lynsey Murdoch to get a sense of how the story could be best transferred to the stage. I have been really impressed by the talent and professionalism of the Hopscotch team, so I’m delighted that they agreed to embark on this project with me! What else about the project might pique your reader’s interest? The main purpose of Pink! the Musical is to bring an important message to young children (in a fun and entertaining way) that we are all “different” in one way or another and that we should treat each other with kindness and respect. Sara Pinto is another brilliant author/illustrator with a distinctive style and lots of quirky ideas. After publishing a number of beautiful ABC and counting books, she collaborated with Beatrice Colin to write a comical chapter book, My Invisible Sister, and produced a series of animated shorts called Quiet Is… for Disney Kids. Janis Mackay is a Scottish writer and storyteller whose first book Magnus Fin and the Ocean Quest won the Floris Books Kelpies Prize in 2009. Two further Magnus Fin books followed and she has a new book coming out this spring called The Accidental Time Traveller. But I should let her tell you about that! Cathy MacPhail is a force of nature. Her boundless imagination and huge enthusiasm for sharing stories makes her a big hit at her many school visits and festival appearances. She is particularly drawn to ghostly and suspenseful plots, and her Tyler Lawless series, about a girl who sees dead people, is excellent. She is an inspiration! Theresa Breslin is another brilliant writer of award-winning historical fiction for teens. She’s written over 30 books, including Divided City which was adapted for the stage and performed to huge acclaim at the Citizens Theatre in Glasgow. Her first book, Simon’s Challenge, was filmed for television, and Whispers in the Graveyard won the highest honour in the UK for children’s writing, a Carnegie Medal. To top it all, (like all the other writers on my list) she is a fantastic lady!